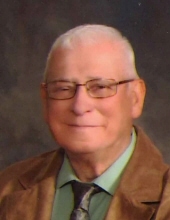 Carl J. Lawrenz, 83, Wayside, passed away peacefully Thursday November 15, 2018. He was born May 5, 1935 to the late Armin and Irma (Zich) Lawrenz. On May 16, 1981 he married JoAnn Carter at Zion Lutheran Church, Morrison. Carl served in the Army Reserve. He retired from Brillion Iron Works after over 40 years of service to the company. Carl was a talented artist, especially drawing and woodwork. He did both exceptionally well. Besides his family, it was the time spent at The Barn with his friends that meant so much to him. He is survived by his children; Diane (special friends Aimee and Tina) Lawrenz, Bonita (Jim) Jackson, and Betty (Russ) Kussow. Two grandchildren; Hannah, and George,his family; Sally Lawrenz, Leon (Jeri) Lawrenz, and Eileen (Dave) Gerrits. JoAnn’s family; Diana Mrozinski, Jackie Carter, Sue (Joe) Scheneske, Dawn (Scott) Sidwell, Judy Carter, Mary (John) Huth, Tina (Steve) Zelten, Debbie (Andy) Geurts, Rose (Mark) Kowaleski, Trudy (Doug) Haynam, special friends; Sheila (Ken) Hein, as well as numerous nieces and nephews. Carl was preceded in death by his wife; JoAnn, his son Steven Lawrenz, and his brother Norman Lawrenz. Carl was further preceded in death by brother in laws; Eugene, Glenn, Jim, Dave, Alby, and sister in law Alice (Joe) Litersky. Friends may call at Zion Lutheran Church, Wayside from 4:00PM – 7:00PM Sunday November 18, 2018. Visitation will continue after 9:00AM Monday at the church, until time of service at 11:00AM with Pastor Austen Welter officiating burial in the church cemetery. Please go to www.nickelfh.com to send online condolences to the family. Nickel Funeral Home, Morrison is assisting the family with arrangements. Special thanks to Wayside Parkview Estates, especially Dawn. To send flowers or a remembrance gift to the family of Carl J. Lawrenz, please visit our Tribute Store. "Email Address" would like to share the life celebration of Carl J. Lawrenz. Click on the "link" to go to share a favorite memory or leave a condolence message for the family.